Hainan has seen over 46 million tourist arrivals in 2014, and tourism revenue grew 13.2% from the previous year to 48.5 billion yuan, according to a press conference held by the Hainan tourism authority in Beijing recently. These statistics show that the project to build Hainan into a top international tourism destination by 2020 has made great strides in the last five years. Facing the growing number of independent tourists, Hainan is accelerating its public service infrastructure. In the past 5 years, a total of 38 visitor information centers have been built at the major transport hubs, commercial districts and tourist distribution centers and 193 public drinking fountains have been installed at 55 tourist attractions across the island. 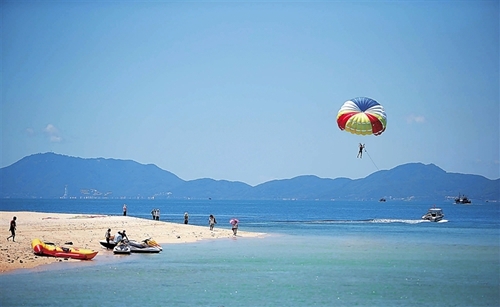 Since 2010, Hainan has been transforming from a sightseeing-type destination into a leisurely holiday destination. A batch of emerging tourism products have been launched on the island, including marine tourism, golf tourism, folklore tourism, rural tourism, shopping tourism and low-altitude airspace helicopter tourism. Yacht rides are becoming more and more popular as a tourist attraction. The province’s yacht industry has seen rapid development. By the end of 2014, Hainan had built nine yacht marinas with a total of 1,800 berths. Hainan is aiming to transform itself into a platform for economic cooperation and cultural exchange. In the last five years, Hainan held more than 10 high-level exchange activities such as the Boao Asian Forum, the BRICS Cities Forum, and the BRICS Leaders Meeting. It also hosted international sporting events such as the Tour of Hainan, Sanya Ladies Open, International Snooker Classic and Asian Beach Volleyball Championship. These events took full advantage of Hainan’s favorable policies and environment, which in turn constantly expanded the province’s international influence.